Nearly a half million people now find themselves in legal limbo in US immigration court. The NBC Bay Area Investigative Unit has discovered that immigrants trying to work within the legal system are getting stuck in a huge and growing backlog. In recent visits to the US Immigration Court in San Francisco, the Investigative Unit observed hearings being set for three years from now. While they wait, these people cannot legally work, pay taxes or contribute to society. “These are the kind of issues where we say the immigration law is like the Twilight Zone of law. Or, like an alternate legal universe where we’ve fallen down Alice’s rabbit hole,” said Dana Leigh Marks, a sitting US Immigration Judge working in the San Francisco Division of the US Immigration Court. California has the largest number of backed-up cases in the US and San Francisco has the second largest in the state, after Los Angeles. Marks, who is also President of the National Association of Immigration Judges, sat down with NBC Bay Area’s Investigative Unit to discuss the challenges and hurdles facing US Immigration courts. Even at this speed, the backlog of cases is overwhelming and growing every year. According to Syracuse University’s Transactional Records Access Clearinghouse (TRAC), there are now 441,939 undocumented immigrants with pending cases before the US Immigration Courts. That’s more than two and a half times the number from 2006 when there were 168,827 cases nationally. 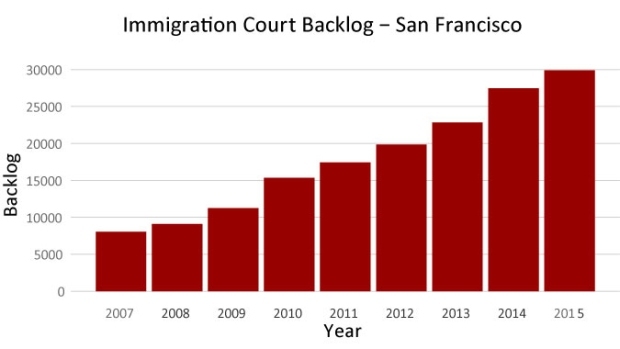 The backlog in San Francisco’s immigration court has risen dramatically from 8,003 cases in 2007, to 29,890 today. “We just don’t have enough time in our daily workload to be able to handle that volume of cases with the kind of care and in-depth scrutiny that’s really necessary,” said Marks. Marks says the weaker cases benefit from this backlog because the undocumented immigrants get to stay for years and years in the US, even though their legal case for staying might be weak. Those with stronger are at a disadvantage. They have to pay costly attorney fees for years, and over time they they might lose witnesses or misplace important paperwork. Marks says the entire structure of US Immigration Courts is problematic. Immigration courts are part of the US Department of Justice, not the Federal Court System. That means there’s no judicial independence and no separation of powers. 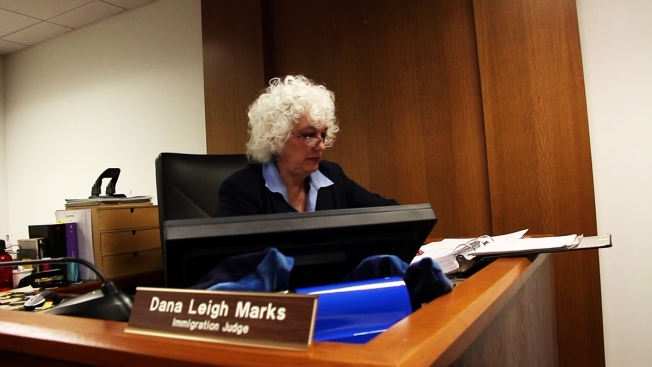 In fact, Marks isn’t technically a judge at all, although she is an attorney. Like all US Immigration Court judges, she is an employee of the US Department of Justice, part of the executive branch, not the judicial. It’s a system that Marks and others who have written about US Immigration Courts say needs to change. Another way Immigration Court is different from criminal court in America is the right to representation. In criminal court, under the US Constitution, if you face trial for a crime and can’t afford an attorney, one is appointed for you by the courts. Not so in US Immigration Court. One reason is that Immigration Court is considered civil, not criminal court. Just as in civil court, if you can’t afford to pay a lawyer, you’re expected to represent yourself. Jaganath and Emily Abraham founded the Social Justice Collaborative, a non-profit based in Oakland that represents immigrants in this system. According to TRAC, more than 73 percent of all undocumented women and children who appeared in US Immigration Court did so without an attorney. Nearly all of that 73 percent lost their cases and were deported. Of the immigrants who did have attorneys, many were still deported but 26.3 percent of them were allowed to stay in the U.S. Even if an immigrant can afford an attorney, there are dangers. “We hear stories all the time of attorneys that charge money and don't end up doing anything or they don’t show up in court,” said Jagannath. It’s a story that the Investigative Unit has heard before. An immigrant who asked to be called Sandra told the Investigative Unit she came to the Bay Area after she was raped and beaten by her father-in-law, a member of one of Guatemala’s violent gangs. Sandra made it to the border but was caught by federal agents. “When I was in detention, I had a lady that told me she was an attorney. So I paid her. In the end, she wasn’t one. It was fraud,” said Sandra. But the attorney never showed up in court or did any work on Sandra’s case. Sandra lost $1,000 to the fraudster, called a “notario” by immigrants. During NBC Bay Area’s investigation, we heard more than a dozen stories like Sandra’s. One woman, who asked us to refer to her as Ana, also lost money to a notario. “He charged us $3,000 and he didn’t do anything for us,” said Ana. He never showed up in court. So the family lost the money and Ana’s sister was deported back to El Salvador where she faces physical abuse and likely death. "The type of civil administrative adjudications that the Executive Office for Immigration Review conducts are designed to be handled within the structure of the Department and it would take significant resources to create an agency separate from an executive branch cabinet officer. The Administration has made several efforts improve the immigration system, and Congress could help alleviate the pressure in the immigration courts but has not moved forward on those fixes."